Irene Watts, an experienced playwright, has adapted eight of Robert Munsch’s stories for performance by young people. The stories included in this volume are: Angela’s Airplane; 50 Below Zero; Millicent and the Wind; Mortimer; Mud Puddle; Murmul, Murmel, Murmel; The Paper Bag Princess; and Stephanie’s Ponytail. Each story is presented in typical play format, preceded by cast listings and useful suggestions for staging, set design, and props and costumes. Illustrations from the original books enliven the pages. 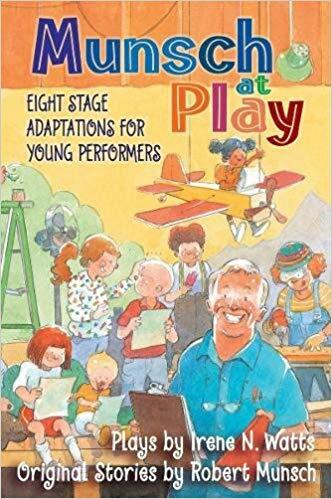 If dramatization is on your list of classroom activities this year, Munsch at Play will do some of the advance work for you, providing scripts and production ideas for familiar stories that students will love to perform and watch. A note from the publisher states that permission is granted to perform these plays “provided the performances are held on a strictly not-for-profit basis and free of charge to the audience.” A performance license must be obtained from Annick Press if a ticket charge is made.